To make sure you can continue to enjoy your conservatory you need to ensure that you carry out regular maintenance. You may be having trouble with your conservatory roof leaking and it requires new lead flashing or was poorly installed originally. We often find that conservatories installed many years ago have a sticky back lead substitute. This degrades very quickly and really is not sufficient in keeping your conservatory water tight. If your conservatory has polycarbonate roof sheets these are very susceptible to become brittle and less hard wearing over time or perhaps they have become discoloured. 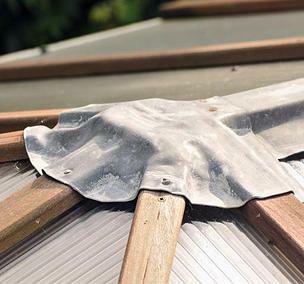 There are some great newer roof sheets on the market that offer better insulations, reflect heat and can sometimes perform up to three times better energy efficient values. We can help by replacing the glass units quickly and efficiently with as little disruption to your home life as possible at a very competitive price. We can discuss with you the best replacement glass for your conservatory. For example if you have a North facing conservatory we can recommend glass that keeps the heat in the building but if you have a South facing conservatory we can recommend glass that keeps the heat out. We can also discuss easy clean glass options for those ‘hard to reach’ areas so your conservatory glass can stay looking it’s best for longer. Why not contact us for a free, no obligation quote for your conservatory repairs?